^ Eusko Jaularitza 2008: 202. ^ Mukarovsky 1963-1964, 1969, 1981. ^ a b c d e Trask, R. L. (1997) The history of Basque. London: Routledge. GB = Hualde & Ortiz de Urbina (eds.) 2003. Hualde, José Ignacio & Jon Ortiz de Urbina (eds.) 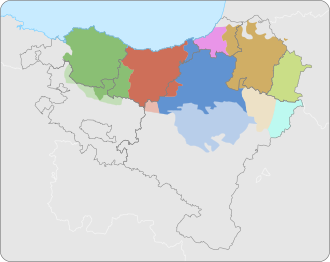 (2003) A grammar of Basque. Berlin/New York: Mouton de Gruyter. Rijk, Rudolf P. G. de (2008) Standard Basque: a progressive grammar. Cambridge, MA. The MIT Press. Trask, R. L. (1997) The history of Basque. London/New York: Routledge.